ATHENS —- A.J. Ouellette showed up at his Pro Day at Ohio University wearing new apparel from a brand he established called NO NAME with the tagline “Beat The Odds”. It’s a source of motivation to not only Ouellette himself, but those kids who come out of high school as under-the-radar players – kids who can play at an elite level, but are overlooked by the big-time programs. Ouellette, for those who may not know his story, came to Ohio University as an unknown walk-on in 2014 out of tiny Covington, Ohio. Quickly he made believers out of coach Frank Solich and his staff as they provided Ouellette a full-ride scholarship before the season opener of his freshman year. Ouellette then repaid the Ohio football program in full by becoming one of the most decorated players in the history of the program. 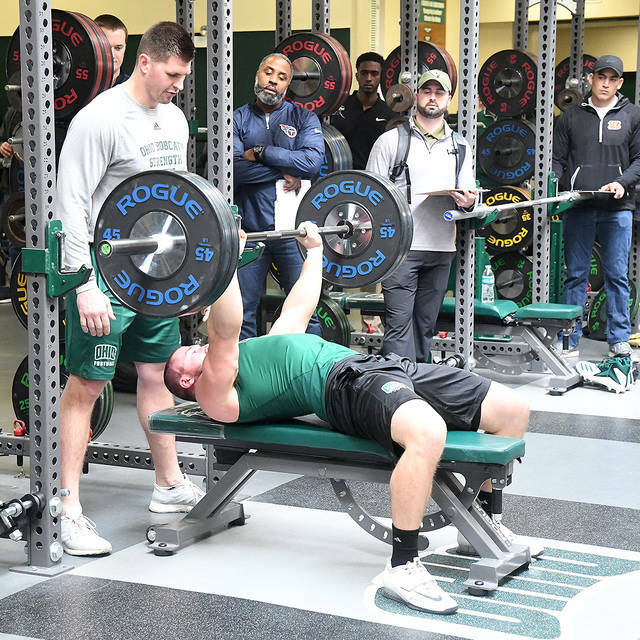 But, despite accumulating 3,829 career rushing yards and totaling 1,306 yards in his senior season, Ouellette wasn’t invited to the NFL Combine – which, only added fuel to the fire as he prepared for his opportunity to showcase his talents to NFL scouts at Ohio University’s Pro Day. And with scouts from all 32 teams on hand Thursday at Ohio University, Ouellette proved he is a player to watch in the upcoming NFL draft by posting numbers that are on par with any of the top prospects. He started things off by bench pressing 225 pounds 32 times, which would have been good for second for running backs at the combine. 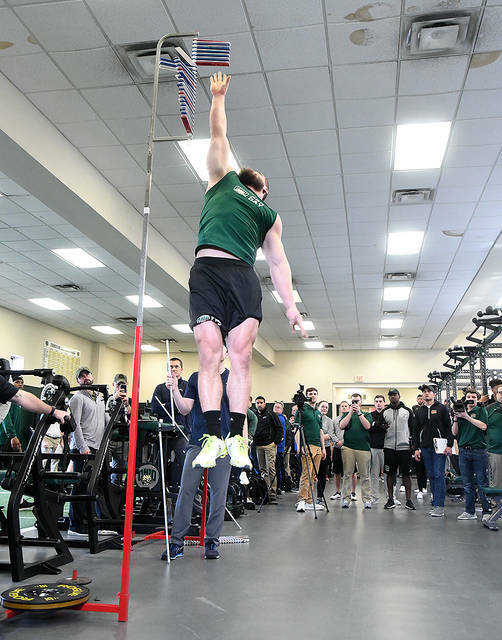 He then recorded 36.5 inches in the vertical, which would have been good for sixth among running backs at the combine. To top it off, Ouellette had two runs in the forty-yard dash where he ran a 4.52 and a 4.48, which would have been good for 5th and 10th among backs at the combine. Ouellette followed that up with a time of 4.0 in the shuttle and a 6.8 time in the L-Cone, which impressed the scouts who were on hand. Ouellette wasn’t the only one feeling good about his performance. “Overall, everyone seemed happy with my numbers,” he said. At the end of the day Ouellette checked all of the boxes for NFL scouts. Pro Day numbers – Yes. Now it’s time to wait and see which NFL team will call his name in the 2019 NFL Draft.